Surprised to read that name as the post title :P. I am sure you are and would have guessed by now which laddoos I am talking about and going to post here. 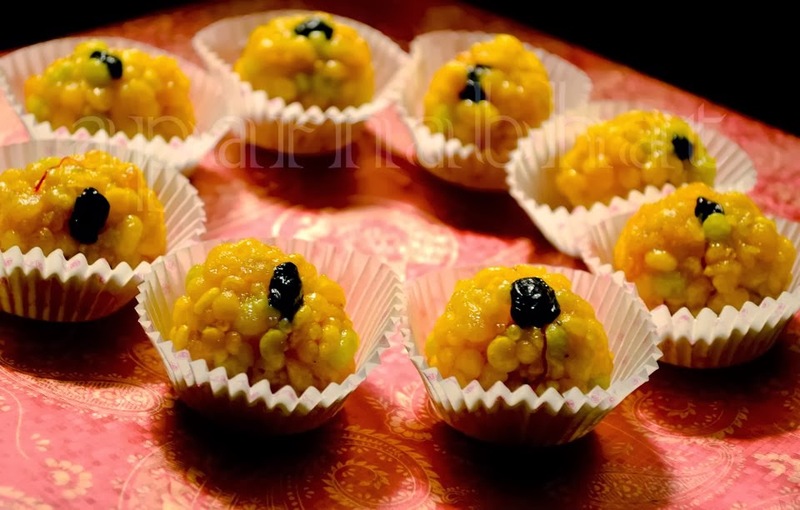 Yes, they are the Boondi laddoos, favourite of Chotta Bheem. I have 2 great fans of Chotta Bheem at my place and thus laddoos invariably has to be their favourite too. Mix sugar with equal amount of water. Let it boil and reach the stage of one thread consistency. Add kesar. This whole process will take about 15-20 minutes. Switch of the flame. Add cardamom powder to this syrup. Take oil for frying in a kadai and heat it. Take the besan batter and pour it over a laddle with round holes. Tap the laddle gently with a spoon so that small balls of besan fall into the oil. Keep the laddle close to the frying kadai so that you get nice round shaped boondis. Fry them for a minute taking care to remove them from oil before they turn crisp. Drain the excess oil and drop them in sugar syrup. Mix them well. Keep repeating this process till all the besan batter is used up. Allow the boondi sugar syrup mixture to rest for sometime. The mixture has to be warm and not cool down completely. Take a tablespoon of mixture in your palm and start pressing them to give a round laddoo shape. Once you are done making all the laddoos from the mixture, take one laddoo at a time and reshape them to a perfect ball. You can place a raisin/broken cashew pieces/ chopped pistas [optional] on each laddoo. Apply little ghee on the palm before going on to the last step to give a glossy look to those laddoos.